They say that “it’s not goodbye, but au revoir” but in the case of our Fifth Year and Upper Sixth students it is certainly more a case of à bientôt, as very soon after our fond farewells and messages of luck, success and happiness on our leavers’ days we were welcoming everyone back into school for their GCSE and A Level exams! I should like to thank and congratulate both these year groups for participating in and contributing to the lovely two days of celebration of their time at the School. They certainly joined in with a number of activities – including my chocolate-based challenges – with real gusto! The Upper Sixth Leavers’ Day celebrations down at Ditton Field don’t quite yet rival Ascot or Henley but they have become quite an event in the social calendar in their own right. One such event that may well rival higher profile occasions is the KGS Black Tie Ball, ‘A Night at the Oval’. I know that the PSA, class reps, alumni reps and lots of other friends within the KGS community are busy gathering numbers and tables but do feel free to buy your tickets individually or as couples and we shall endeavour to allocate everyone appropriately. With stunning views over both central London and the Oval turf, wonderful food, an esteemed speaker, a chance to bid on the fabulous auction prizes and a wonderful live band, it promises to be a night to remember. Before then, of course, we have lots of events to enjoy before we finish for the summer. I am particularly looking forward to the Upper Sixth Graduation, the National Schools’ and Henley Regattas and Sports Day – or as it is otherwise known, ‘House Athletics’, a day which commonly sorts the final placing for the awarding of the House Championship trophy. If I don’t see you there, hopefully I will see you on the touchline or boundary or towpath soon, if not in the stalls at House Music or at the Junior School production of Peter Pan – which is excellent, by the way. I have recently enjoyed the opportunity to meet and share views with class reps at the now-termly ‘Meet the Head’ mornings, kindly organised by the PSA. If you’ve ever considered being a class rep, now’s the time to get on board and to share and air your views and ideas. 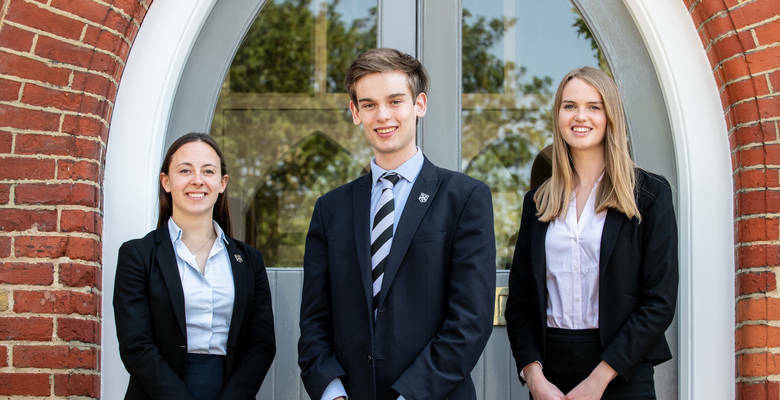 Finally, as we thank our outgoing Upper Sixth for all that they have contributed to the School it is time to welcome and congratulate our new team of Prefects and Senior Prefects led by School Captains Katie Orrell and Toby Fairhurst and School Vice-Captain Olivia Gooding. We look forward to their year of leadership, particularly in developing the students’ School Forum. We wish them all the very best of success in what will undoubtedly be a busy and exciting year ahead.